Originally a four piece group formed in 1961, The Strollers came together having worked as apprentices at the Boulton and Paul Aircraft factory in Wolverhampton. 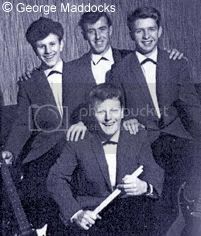 The Strollers were one of Wolverhampton’s earliest and most popular groups as well as being influential amongst up and coming aspiring local young musicians in the town. Naturally, the music scene was just a couple of years out of the skiffle era with its primitive equipment such as the tea chest bass and cheap acoustic guitars with a microphone cellotaped to the front as an improvised pick-up – only the likes of Lonnie Donegan could afford a coveted Martin guitar! 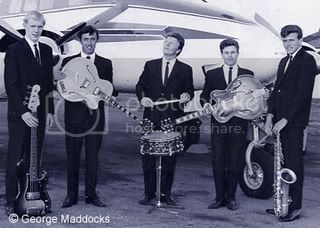 We now aspired to be like the stars of popular TV shows such as “Oh Boy” and “Six-Five Special” with their line up of three guitars, drums and a lead singer – all dressed in smart shiny suits of course. Many of the national and international groups had started to augment their sound with the addition of either an organ or saxophone – or even both so, to keep up appearances The Strollers recruited Tony Perry on sax. The group’s first brush with fame was a tour of the West Country in 1962 backing up-and-coming singer/pop idol Paul Raven who later went on to become known as Gary Glitter. Immediately upon their return to Wolverhampton, the enterprising local impresario Roger Allen signed The Strollers up and became their manager. In fact, they were Roger’s first group. Roger had the foresight to expand on the success of the group by recruiting vocalist Roy Grant as front man. Roy had already gained a reputation as a Roy Orbison soundalike and this clever combination projected the group into one of the area’s most successful and sought after acts during 1962 and 1963. Remember, at this point a large number of the groups mentioned on the BrumBeat.net site had not yet, or only just started out! Indeed, The Beatles themselves had only recently broken into the charts with their first single and had yet to conquer America. The Strollers however were busy conquering Liverpool by going down a storm at The Iron Door Club and they had Freddie Starr and The Midnighters as their ‘warm up’ act! Bear in mind that there were around 350 local Merseyside groups at the time making this a testament to The Strollers popularity. Back in Wolverhampton, the group continued the popular gig circuit i.e. The Staffordshire Volunteer, The Cleveland Arms, The Three Men in a Boat, The Civic Hall, The Connaught, The Old Hill Plaza and The Woolpack – to name but a few. Interestingly, it was The Strollers who popularised The Cleveland Arms Sunday lunch time gigs. This is the venue that all the other bands would go to in order to sus out the competition and possibly ‘poach’ a new band member? In fact, there was a great comeraderie amongst all the local bands and there was plenty of work to go round for everyone and then some! For instance, my own band Varsity Rag was, from 1967 to 1970 averaging twenty eight gigs a month, every month! These days, bands are lucky to get twenty eight gigs a year. For all things there is a season and during 1964 The Strollers decided to call it a day as a group. Roy Grant had decided to leave and lead guitarist Don Maddocks had been headhunted by The Tommy Burton Band. Perhaps this was a natural progression as George was already dipping his own toes into management and promotion by managing local group The Staffords following their impassioned plea via The Express and Star for a manager. He was also promoting the Saturday night spots at Sedgley Parish Hall. Tony was also busy promoting gigs at The Staffordshire Volunteer. In the event, and in competition with the Astra Agency which had been started a year earlier by Len Rowe, George, Tony and their former manager Roger Allen joined forces as a partnership called PMA intending to take their slice of the burgeoning music scene in Wolverhampton. The local groups liked the fact that George and Tony had risen to management “from the shop floor” as it were and therefore knew the business from the musician’s standpoint. Roger however, certainly made up for his non-musician background with his flamboyant personality – he was known locally as “Roger the Dodger” by the way. 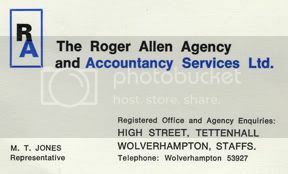 This new trio of managers at PMA worked well until, it seems, George and Tony joined Astra and Roger formed The Roger Allen Agency and Accountancy Sevice in Tettenhall just outside town with Maurice Jones. In addition to being part of Astra, George also managed the hugely successful and popular Lafayette Club featuring local, national and international acts. To this day, Tony Perry still holds Lafayette Reunion nights but, now at The Connaught in Tettenhall Road. During 1968 Roger merged with Astra to become Astra-Allen. Sadly, the live music scene in Wolverhampton was all but finished by the end of the decade with the closure of most of the venues and the unfortunate trend towards discos and disc jockeys. Although The Strollers were not a signed band, that should not detract from the importance of their contribution to the the local music scene and their influence on those who followed in their wake. Regarding PMA, well this was the pinnacle of group management in the town and as such, all of us owe a debt of gratitude for the prolific amount of work that was put our way together with all of the fond memories that we still cherish to this day. George has since retired to Spain, Tony is still a promoter in Wolverhampton and Roger? well, he is now selling time share in Tenerife!! This biography was written by Brian W. Nicholls (formerly of Varsity Rag) in consultation with George Maddocks and with reference to Keith Farley’s book ‘N Between Times coupled with his own extensive experience of the period. The Strollers photograph taken at the Boulton & Paul plant is the copyright of George Maddocks.. I remember the good old days when i used to watch the Strollers rehearse at the Three Tuns Pub, fordhouses. I too worked at Boulton & Paul in the cost office, and one of my colleagues was Tony Perry. I also played one season for the B & P football team with Curly Davies and George Maddocks. Great days, and very fond memories.